Dogwoods owner, Deb Normandeau had an interest in dogs and making them look good for as long as she can remember. Her childhood memories are filled with stories of her dressing her first pet, a smooth red dachshund named Daisy Belle, in doll clothes and pushing her around in a stroller. This may be part of the reason she went on to complete a degree in Fashion Merchandizing. Eventually, influences from a co-worker with experience showing dogs, introduced her to pet grooming and caring for dogs. Deb shortly there after returned to school for professional grooming and began working with veterinarians. In what feels like no time at all, she set off on her own, providing grooming care of the highest standards to her own clients. With continued growth and regularly being asked by her clients to watch their pets, it was clear it was time to do something different. 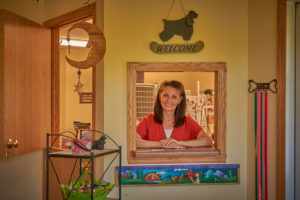 The business was growing but Deb knew that if she was to continue to care for her clients’ pets, she needed to be able to offer the guests more than just a kennel to sleep in. After 15 years on the Eastside of Madison, it was time to relocate. After moving to Mount Horeb, WI with her husband, Ed, Deb opened their home to what is The Dogwoods today. Deb has continued growing her passion for working with dogs and offers kennel-free boarding along with weekly dog daycare services, all the while still providing grooming care of the highest standards for her guests.